Traditional storage architectures are, in many cases, not able to meet the performance and capacity requirements of mobile, analytics, and cloud app workloads. Thus, the rise of two technologies in particular—scale-out SDS and NVMe—is being largely driven by a need to provide higher, more scalable storage performance for these workloads. 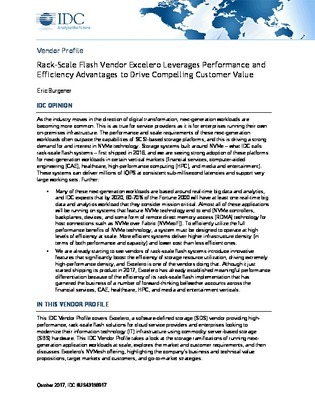 With this in mind, this IDC report covers Excelero, an SDS vendor providing high-performance, rack-scale flash solutions for enterprises looking to evolve their infrastructure using commodity server-based storage hardware. Read on for the essentials of their NVMesh offering, highlighting the company's business and technical value propositions.